As you may have guessed if you’ve been browsing my website, I often say I’m about choice. This is just one reason why I have decided to include a couple of reviews from the manufacturer Kraus. This company is well known in Europe and for the fact it has brought its timeless European designs to the American market. 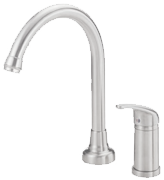 Not only will you find (in my humble opinion) some of the most attractive kitchen faucets I’ve chosen for you, there is an abundance of features included that will make life in your kitchen far easier. So, if you want pull out or a commercial type faucet, perhaps this is the manufacturer for you.